The Georgiana Collection was created for my little grand daughter born on my birthday last year. This collection is perfect for any heirloom embroidery but I need to make a special dress for her that is not too fancy. As the collection features scalloped edges and endless embroidery I am aiming at producing a little dress for Georgie with an underskirt featuring the scallops. When shopping I found a beautiful pale blue needle cord just perfect for this project. The first thing I needed to do was test out a Georgiana design on the needle cord. As you can see the design stitched out reasonably well on the needle cord and went out of line only on the scalloped edge on the right. I liked the overall effect though and am considering whether I need to stitch the scallops twice or not use them on the blue fabric at all. 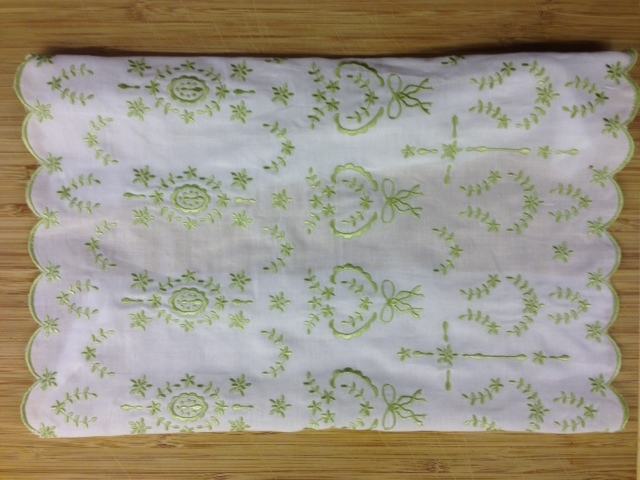 I intend to embroider a white cotton lawn under skirt which would obviously work perfectly for the scallops! View all 4 sets in the collection by clicking on the link below. 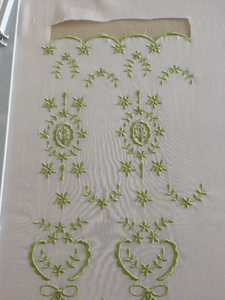 Having done that I needed to test out the Georgiana endless scalloped design on cotton lawn. 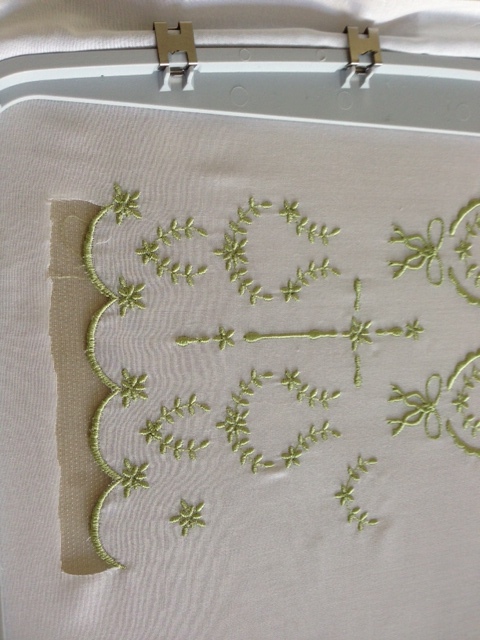 Although I will do the embroidery in white I have done my test out here in green so you can see the result clearly. I stitched out GFE_GEO_4_5 which is one of the double scalloped edge designs. 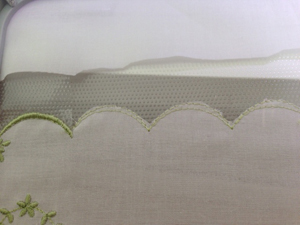 If you require more information on embroidering scalloped edges this is included in the PDF which comes with each set in this collection. 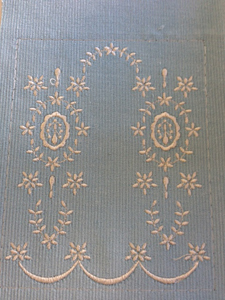 Although the design was stitched in one colour I did not change it to one colour on my machine until I had stitched out the first colour which was the underlay for the scallops. If you do this before you start, the machine will not stop for you to trim the scallops You can see the first stitch out with the trimmings. As I have a Designer Diamond I do not have to be precise in positioning the fabric in the hoop for the second stitch out. However it was still a challenge for me to get it all aligned and I confess I wish I had draw some lines on the fabric to help me! You can see the positioning here and on my screen I needed to align the scallops at the top and bottom of the design so they stitched out perfectly. Here you see my needle which needed to be against the last scallop. The first alignment was relatively easy but the second one at the top was more challenging as I need to swivel the design slightly. Another good reason for drawing plenty of alignment lines! You will notice that when I went to stitch out my second design the scallops where a little out. However as the first colour way is only a series of running stitches and it was only a marginal misalignment I made a little adjustment and stitched the second design out without re hooping. I suggest you have a few practices at this before you embroider your actual fabric. A little fray check may be necessary where the designs join. Here is my finished endless scalloped stitch out. The edges needed a little trim where the fabric ends were protruding. 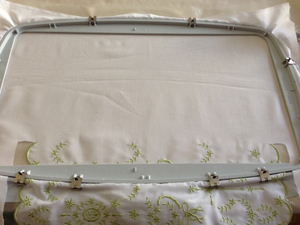 When you stitch white on white any tiny errors will not be so obvious. 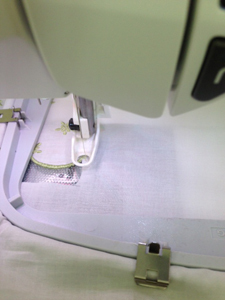 If you do not have precise positioning on your machine you need to use the Outline alignment stitches to place each design alongside the previous one. This is easy to do and I have tutorials on my website to help you master this technique. More on the development of this project coming soon! It looks beautiful Hazel! Great job! I know your GD will love it when completed! Thanks for sharing! “Inspiration” is the perfect word for this. It has inspired me as to which of your sets to use for a special Christmas present for my sister. I always try to find something different since she also sews and embroiders. Thank you, Hazel.